← Did You Think That Was A Healthy Choice? I was googling a little earlier today looking for health inspiration blogs. Because it’s interesting to see what’s out there. And I was left very curious after one of my top hits on beloved google took me to a blog, with a post about how the blog was moving to a new address for her lifestyle change. There was a link to the new address AND a link to her girlfriend’s blog who was also doing the lifestyle change with her. To my surprise (or was I really surprised) the new link was to an address that doesn’t exist. And her girlfriend’s blog had one (that is 1, singular term) post about how excited she was about the new blog and the new lifestyle and to keep posted on what would happen next. I’m glad I didn’t see these 10 months ago and held my breath waiting for the next one. Because that was all there was. So I am left wondering; what happened to the girls? Did they start their new lifestyle and failed to write about it? Did they not even make it past day one of their new life and then didn’t bother to write anything. What happened? Is this what often happens in ‘real life’ too (blogging can be what you want it to be doesn’t have to be real life at all), we are all talk and no action? It’s easy to say I’ll do this and I’ll do that, but it’s a little harder when you actually have to do something about it. So most of us just talk about it. Often and loud. I’m gonna do it! Gonna, gonna, gonna. Do you know why you keep doing that? Because you complicate things. Make it sound hard and big. Too hard and too big. You talk yourself out of it. Stop it. Stop the talking. Start the doing. But just a little bit today and then a little bit tomorrow. Small changes and Something Every Day. It’s all for the better and it really isn’t that hard. You just make it hard in your head! Stop it. What did you choose? 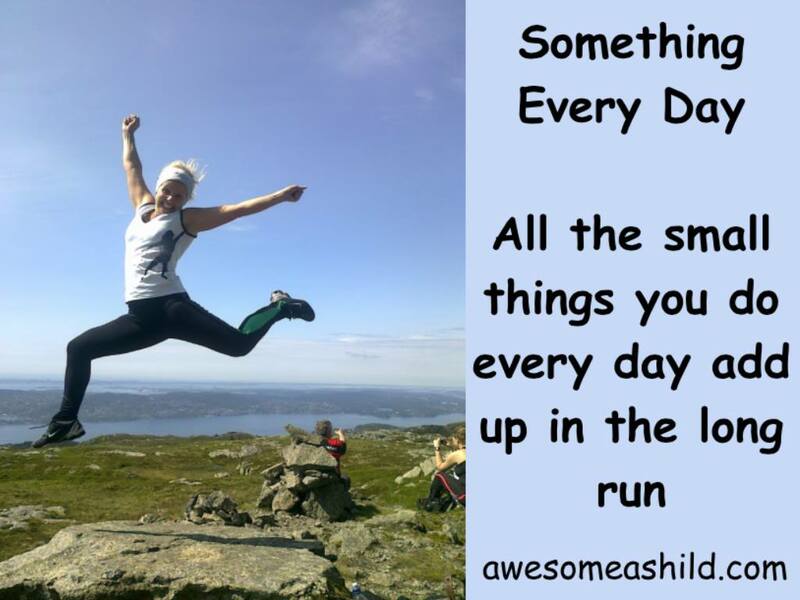 What is your Something Every Day today? Don’t just tell me though, go and do it too. If not, it doesn’t count! This entry was posted in Goal Setting, Personal Development, Something Every Day and tagged Blog, Gonna, Health Inspiration Blog, Inspiration, Lifestyle Change, Something Every Day. Bookmark the permalink.